Nearly a quarter-century is a long time for any restaurant to be around, especially in a neighborhood with as much turnover as Manayunk. And Zesty's, which became one of the neighborhood's pioneers in 1993, is an admittedly curious candidate to achieve such longevity. The dining room is a seemingly random hodgepodge of bold blue and red furniture lighted by dangling globe map lamps, with fish tanks and the occasional live-music act strumming away covers in the corner. Nearly the entire crowd on New Year's Eve, when we happened in spontaneously, appeared to be related. But I was quickly reminded, once the food started arriving, what has given this standby the goods to survive a neighborhood's ups and downs. Owner Tom Konidaris' place remains one of the area's solid destinations for classic Greek taverna fare, from huge braised lamb shanks to flamed saganaki cheese. In particular, his kitchen specializes in some outstanding whole fish. 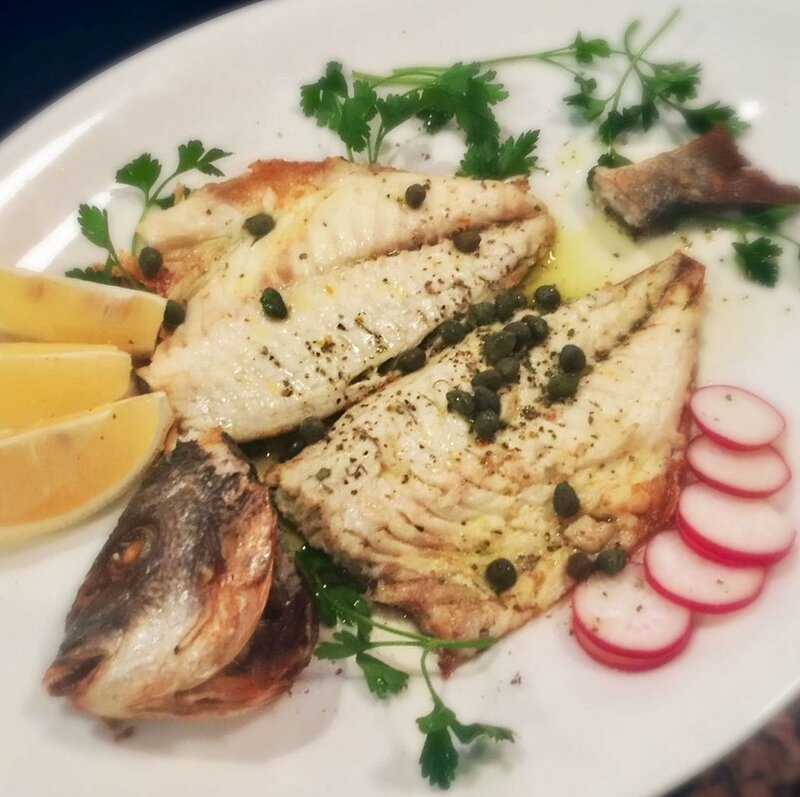 My dorade was large for $34 - nearly two pounds - and perfectly cooked, the heat-crisped fillets deboned and butterflied open beneath a lemony gloss of Kalamata olive oil, saffron, and capers. And it was served with the head and tail, of course. "Don't miss all the meat on that head!" manager Eric Papougenis advised, just as I was digging into the cheeks. Such old-world charms and good ingredients, no doubt, may be the keys to Zesty's longevity. She ordered the insalata tricolore. I chose the Greek salad. Then she selected a gnocchi al gorgonzola and vitello al limone. Meanwhile, I was deciding on the spanakopita and arni kapama. Was she at a trattoria dining Italian, and I all alone at a nearby Greek taverna shouting “opah” between courses? No, we were both at…Zesty’s in Manayunk, where the menu has given new meaning to Greco-Roman. Zesty’s the work of Tom Konidaris, opened back in 1993, and a year ago expanded next door to double its size. It’s designed for quiet dining, features an open kitchen, and has a staff that…takes pride in serving you. The decor is artsy, yet subtle, and dotted with tastefully done playful visuals. Bottom line is that this Italian-Greek combination restaurant is able to put it all together and make a stylish and polished statement. Which can be attributed to the talents of Konidaris, a serious food person who excels in many areas of the business, from conceptualizing to cooking and understanding the importance of service as part of the art. Zesty’s dishes have that made-from-scratch feel. In keeping with the Mediterranean food theme, the delicious bread, served warm, is accompanied by rich olive oil flavored with garlic and herbs. The cuisine combo at Manayunk’s new Zesty’s – Italian and Greek – seems a perfect match in light of the continuing emphasis on the health benefits of the Mediterranean diet. This attractive bistro has an open kitchen and it’s as bright as a Neapolitan folk tune and as graceful and earthy as a Greek dance. Zesty’s is the work of Tom Konidaris, who operated Onassis, a Greek restaurant at 17th and Sansom Streets that drew crowds for both dining and dancing in the late 1970s and early 1980s. Zesty’s, much like Onassis, is, well, pretty zesty. Since 1993 Zesty’s menu has given new meaning to the word Greco-Roman offering an extensive selection of Greek, Italian and Mediterranean specialties. Zesty’s Restaurant is located in Manayunk. Named a National Historic District in 1983, Manayunk is centrally located, along the Schuykill River, to Center City, the Main Line as well as the entire Delaware Valley. With over 65 chic boutiques and galleries, and about 30 restaurants, Manayunk is a world unto itself. It is these demographics, along with unique shopping and dining experiences that have helped Manayunk consistently draw crowds of great numbers. Manayunk received its name from the Lenape Indian word “manaiunk” meaning, “where we go to drink.” The availability of water, with the completion of the Manayunk Canal, drew people to the area. It provided power for the construction of textile and paper mills and provided the transportation link to the port of Philadelphia and inland to the farmlands of Pennsylvania.